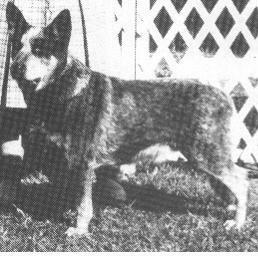 The inaugural meeting of the Australian Cattle Dog Society of NSW was held on the 8th august,1971 at the home of Mrs. O Ridley. Among those present were: Mr. R O’Donnell in the Chair, Mr. & Mrs. R Atkins, Mrs. O Ridley, Mrs. B Bearup, Mr. B Brown, Mr. & Mrs. R Anderson, Mr. & Mrs. P Townley, Mr. Wilson, Mrs. Holwick, Mr. & Mrs. B Walters, Mr. L Dixon, Mr. W Britt, Mr. A Withers, Mrs. H Hancock, Mr. R Devenish, Mr. & Mrs. E Shipway, Mrs. E Bunnell, Mr. Gooi, Mrs. E Park, Mr. W Watson. Mrs. H Hancock moved that a Club be formed to cater for the Australian Cattle Dog, seconded Mr. R Atkins. 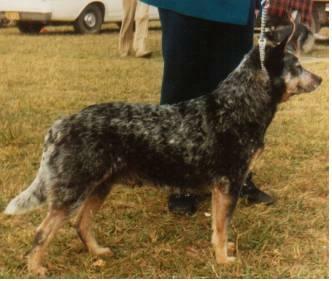 Mrs. O Ridley moved, that the Club be named the Australian Cattle Dog Society of NSW, seconded Mrs. B Bearup. The RAS Kennel Control granted licence to the recently formed Australian Cattle Dog Society of NSW on 21st October 1971. Affiliation with the RAS Kennel Control was approved 18th September 1972. The object of the Society was to promote and improve the breeding and exhibiting of the Australian Cattle Dog. The Society held its first Show, a Parade, at Minto Show Ground on 2nd April 1972 - Judge Mr. A P Bates. Patrons: Mrs. P Downs, Mr. W Bruce Mr. W Spilstead. Admittance: Exhibitors free, Children free, Visitors 20 cents Catalogues 20 cents. If ever a dog will play a part in the economy of Australia, this is the dog. With the changing conditions in the sheep industry, cattle are playing a major part in this country, and the Australian Cattle Dog is right up there with them. The Australian Cattle Dog Society was formed late in 1971 because of a need to put these dogs back in the position of one of the foremost dogs in Australia today. Not only as working dogs but dogs capable of taking out major show awards. As obedience dogs, they are unsurpassed, as faithful and loyal companion or a guard dog – brooking no interference as a faithful and loyal companion or with his masters’ family or his possessions. Membership Fees: Single $1.50, Dual $2.00, Junior (under 16 years) 30 cents. 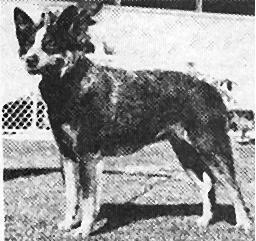 The Australian Cattle Dog Society of NSW held its first championship Show at Minto Showground on 22nd April 1973 (Easter), Judge Mr. H. West. Vet Officer: Mr. C E J Walker BVSc. An early promotional endeavour was the donation of a bronze plaque to the Scone Shire Council as a tribute to Mr. Thomas Hall. The plaque was mounted on a new bridge in the area and named “The Blue Heeler Bridge” which was officially opened by the Minister for Local Government and Planning, Mr. Harry Jensen on the 14th August 1976. A breed Seminar was held in 1978 from which a booklet was based with great success and sold throughout the world. The Society was represented each year at Agview and various promotion days have been held. Sunday, 19th April 1981, The Society held its first Obedience Trial. Classes judged were Novice, Open & UD. The highest scoring dog was Mrs. L Teston’s Beronganella Robyn CDX, Judge Mr. H Exton. In 1988, Australia’s bi-centennial year, the Society was prominent in presenting the Australian Dog Breeds Spectacular held in conjunction with other Australian Breed Clubs at Marayong Oval, Blacktown. 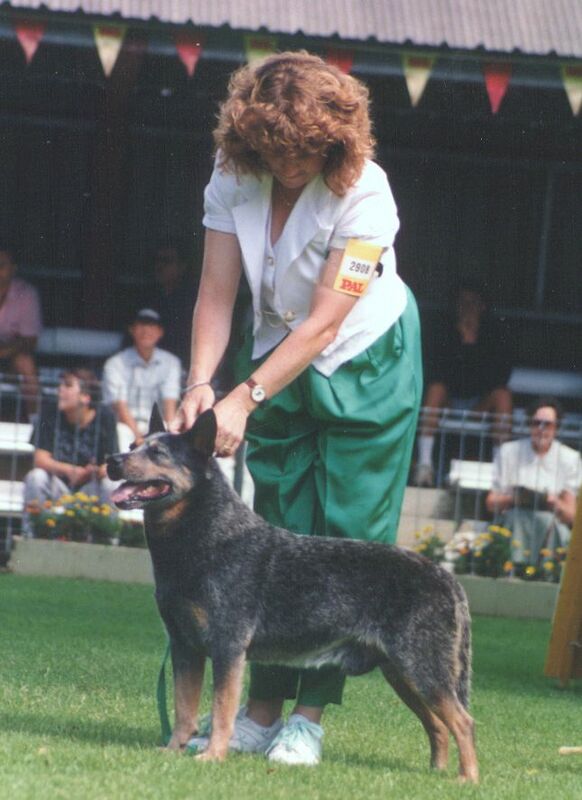 The Australian Cattle Dog Society of NSW held its 25th Anniversary Championship Show & Obedience Trial on 5th April 1998 at the Bill Spilstead Complex for Canine Affairs, Erskine Park. Ms D Easter, Obedience - Utility - Open - Novice. 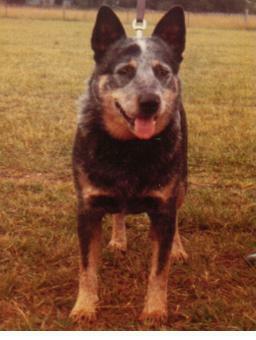 A Seminar was organised by the Australian Cattle Dog Society and presented by Dr Gregory Acland on 23rd June 1998. Despite the freezing weather and raging storms closing many roads, people came from as far as the Central Coast, The Southern Highlands and the ACT. Unfortunately the Society ceased conducting Obedience trials in September 1998, as due to the aging of our Members, there were insufficient entries of Australian cattle Dogs. Classes judged were Utility, Open & Novice, Judge Mrs. A D Yerbury. The results were: Utility, no qualifiers: Open, Miljen Triple trouble CDX TD Owned by M Shepherd: Novice, Shelloy Lois Owned by P L & J I Mortimer. Early Breeders kept very little recorded information on their breeding programmes, as their only interest was in developing the ideal Cattle Dog best suited to Australian conditions. There is a marked difference of opinion as to the breeds that were actually used to develop the purebred Cattle Dog that we see today.